-CLICK HERE for information on how to get the invitation you want and tips on how and where to print, plus a few more things. -CLICK HERE for information on how to customize your DIY Invitation and to see all the available designs. I love creating wedding invitations and I have been working hard to give you a new option to save money on your invitations -- DIY Invitations! I love working with you to create your perfect design and helping you make your wedding day the best it can be, all without exceeding your budget. You save a lot of money and you can add unlimited personalization by being in control of your own wedding invitation printing. Depending on how you choose to print your invitations, you may be able to personalize the paper color, weight, size, texture, and special additions. You'll also get to decide how to package your invitations, add little details, and let your personality influence the final product. I format your design for printing, you just let me know how you're wanting to get it printing-- whether you're printing it at home or having it printed by a professional or artist (like a letterpress artist). Being able to DIY your invitations allows you TONS of flexibility. This flexibility comes in your many options for paper materials, texture, color, weight, envelope liners, foiling, folding your invitation, double-sided, and many, many more embellishments that I won't go into detail about. Because of this ultimate sky-is-the-limit world, it is nearly impossible to tell you how much your invitations will cost, but I'll do the best I can to help you understand if this is something possible and desirable to you. any extra costs, like cutting, processing, etc. ask about their highest quality printing, or if they commonly print wedding invitations. Some places even have books of wedding invitations they have printed at their location and you can see if you like their printing quality. ask if you'll get a discount for bringing in your own paper, of by purchasing one of their papers. do they have a discount for bulk orders? 2. Check out paper supply stores for the best prices on papers, envelopes, and other supplies, but if you don't have one near you, you can buy them online and get a pretty good price. Consider purchasing in bulk, like a whole ream of card stock or a box of envelopes, even if you don't need all of them. Buying your paper/envelopes by the single is a lot more expensive. 3. Consider any embellishments you want to add and how much they are. Can you do them yourself? 4. Save money when you mail. Some envelope sizes and postcards cost more than others to mail. Consider using postcards for your Save-the-Dates and RSVPs. Postcards have reduced postage costs and they also save you money by passing on the envelopes. You can read up on the differences in postcard costs on the USPS website. 5. Before you finalize anything, have a proof printed! -Make sure you check out my Etsy policies. My policies lay out what is acceptable (and not) to do with my designs. -Choose a lovely cardstock (usually 80# or higher) that will work well with your printer. My favorite is 120# but most printers don't offer it and at-home printers have a hard time with the thicker paper. If you want a thicker paper, buy a few sheets and try it out before buying a huge supply. -Paper supply stores like XPEDX (see below) is a great resource for all your paper needs and they know a lot of random paper facts too. They also usually have matching envelopes for whatever you'd like, and if they don't have it in stock, they can order the exact one you want. -Any office supply store (OFFICE MAX, STAPLES, etc) will have some cardstock papers to choose from, or buy online. Because of these sizes, when you receive your formatted file, you will see that two invitations (or two RSVPs/Save-the-Dates) fit on a sheet. This cuts your printing costs in half! -Either way you choose to do it, make sure to PRINT A PROOF FIRST, before you print all of your invitations. If there happens to be something not quite right, printing a proof first will help save money and headaches. 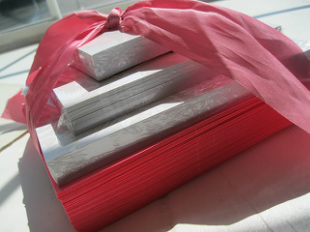 -Even if you print at home, I'd recommend going somewhere to have them cut the invitations for you. Alphagraphics has been precise and fast, and they will cut an entire stack of paper for $1.10 a cut, which is waaaay better than cutting them all by yourself. First, put all of the finalized files you received from me via email, onto a USB drive. Take that drive to the profession and have THEM pick which file they want to use. Again, have them print 1 PROOF FIRST. -Alphagraphics- (for printing and cutting) Not only does their printing job look professional, it has a glossy quality to it (so it doesn't look like it's been printed on a home printer). They also cut your designs for you for $1.10 a cut (for the whole stack), which is a really good deal. If I remember correctly, they charge about $.60 per color printing a side (double sided will be about $1.20). The regular invitation designs on my website are all 5x7", so you'll get two to an 8.5x11" sheet. Means= cut the printing price in half. -Walmart/Walgreens/Any photo printing place- I have printed my designs through local and chain photo labs. My designs look great, especially if you're getting a design with a photo, like baby announcements. You can usually find an online coupon for Walgreens to get extra off your photo printing. -Xpedx- (for paper products) Xpedx has a ton of papers and envelopes to choose from, in color, size, and weight. I'd recommend choosing at least an 80# cardstock. Alphagraphics can't print on anything heavier, and the 80# paper makes a nice weighty invitation when you feel it. It doesn't feel like normal printer paper (which is only 60#). -Overnightprints.com- (for postcards and business cards) If you'd like to have someone take over and do all the printing and paper deciding, I am really happy with Overnightprints.com. They accept designs online and allow you some decisions, like rounded corners, glossy finishes, and such. They print excellent postcards, so if you'd like an invitation sent out like a postcard, this is the way I'd go. *Unfortunately I do not sell the PhotoShop/Illustrator files of my designs. All of the designs are my property, and many of the designs are directly from my hand-drawn sketchbook. Retaining the ownership of the PSD file is the only way I can regulate the copyright to them.